What marijuana enthusiast would not want to have a 420 themed lighter leash to keep their lighter close by? 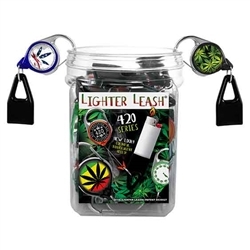 The 420 series lighter leash has the 420 culture in mind featuring 5 super cool collectible marijuana leaves styles on the face of each lighter leash. Clips on just about anything and you can more than double your money to your customer by selling them for only $3.99 each. Newport Zero Butane Torch Green 6"